We have had a great start to the academic year. The children have settled in extremely well into their classes and we are looking forward to an exciting year ahead. We will continue to work in partnership with Wooden Cellar for food catering for this upcoming year. Wooden Cellar provide nutritious meals that can be customized to your child’s dietary needs. There will be a weekly menu available, which can be completed and submitted to Ms. Jodi. If you have further questions or queries, please do not hesitate to ask at reception. Ms. Sasha, the principal from Victory Heights will be visiting The Wonder Years Nursery on Tuesday, October 10th. 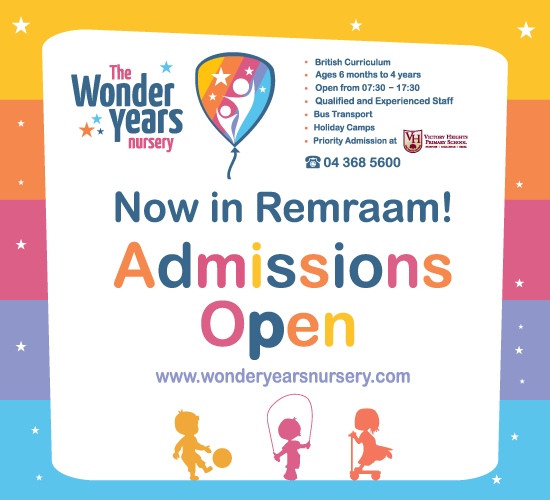 You can use this opportunity to ask her any specific questions you may have about the school as well as familiarize yourself with the transition process from nursery to school life. We would like to ensure that you have submitted all the required paperwork and admissions forms to the reception. If your child has any missing documents that have been sent home, please complete those and submit them to reception the earliest. This week, the class mum contact details have been collected from teachers in order for us to form a “Class Mums” group. As manager, I know it is essential to make sure I maintain a strong, communicative relationship with you all so I would like to propose a fortnightly coffee morning for class mums to come along and discuss any issues parents may be having and to brainstorm for events to enhance the children’s experiences here at the Wonder Years Nursery. Our first meeting will take place next Monday October 9th. Our team will be conducting a practice fire safety procedure in the last week of October. The fire safety procedures are designed to help our school respond calmly and effectively in the event of an emergency. We would like to inform you that we are lucky to be joined by a volunteer this term who will be supporting our teachers in class. Ms. Hala is currently working towards completing her early childcare course so we would like to welcome her onboard and wish her well in her studies. Blink Day- Please dress your child in either pink or blue today in aid of breast cancer and prostate cancer awareness. Victory Heights Primary also invite you to their Blink day at 2.30pm. Children will be donating a minimum of 10dhs which will ALL go to the Al Jalila Foundation in aid of cancer research and treatment. You will have the opportunity to walk around the stalls and use the coupons to ‘purchase’ 4 pink and blue gifts, treats or novelties. Dress Up day. This will be our first dress-up day here at WYN this academic year where your child can come dressed as any fairy character they choose. We really appreciate all of your support and kind words. Please do not hesitate to contact your class teacher if you have any questions or areas of concern and we will do our utmost to help. If you do have any feedback, ideas and suggestions, we welcome them as we wish only to continue improving our service. As always, thank you for your continuous support, teamwork & cooperation.